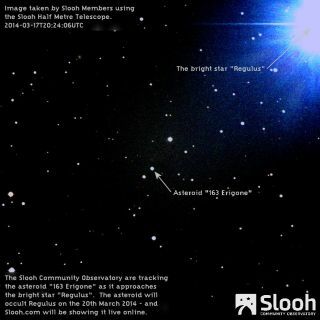 The asteroid 163 Erigone is seen near the bright star Regulus on March 17, 2014, just days ahead of a rare March 20 occultation of the star by the asteroid. This image was taken by the Slooh Half-Meter Telescope, a remotely operated telescope used by the Slooh online skywatching website. NEW YORK - Hey New Yorkers! If you're out at the bars late tonight, you might want to check out a very rare cosmic treat happening above the Big Apple. An asteroid the size of Rhode Island will pass in front of one of the brightest stars in the night sky during the wee hours of tomorrow morning (March 20), and some astronomers are taking to NYC's bars to spread the word. The 45-mile-wide (72 kilometers) asteroid 163 Erigone will eclipse the star Regulus after midnight on Thursday. The giant space rock will briefly blot out the star for observers in part of North America for a few seconds starting at around 2 a.m. EDT (0600 GMT). Weather permitting, Regulus' wink will be visible for skywatchers in about a 100-mile wide path north and west of New York City, but anyone with an Internet connection should be able to watch the cosmic show as well. The online Slooh Space Camera will host a live Regulus eclipse webcast, and you can watch the broadcast on Space.com or directly through the Slooh website. The bright star Regulus will vanish behind the asteroid 163 Erigone for several seconds on the morning of March 20, 2014, for well-placed skywatchers. The star is located in the "sickle" of the constellation Leo, the Lion. Space fans can also watch the rare occultation from the deck of the Intrepid aircraft carrier. The Intrepid Sea, Air & Space Museum (which is also the home to NASA's space shuttle Enterprise) is hosting a viewing of the event with the Amateur Astronomers Association of New York from midnight until 2:30 a.m. EDT on Thursday. While observers won't be able to see the asteroid itself, those looking skyward from the viewing area should be able to see Regulus wink for at least 14 seconds, so long as clouds or rain don't spoil the show. Editor's note: If you snap a great photo of rare asteroid occultation of the star Regulus, or any other night sky view, and would like to share it with Space.com for a story or gallery please send comments and images to managing editor Tariq Malik at: spacephotos@space.com.